The summer months allow athletes and rehabilitation patients to move their exercises outdoors and away from stuffy indoor offices and gyms. Extended hours of daylight and warmer temperatures are welcomed by many and help break up the tired routines of a long winter. There are some safety concerns you should be aware of when exerting energy in the heat. 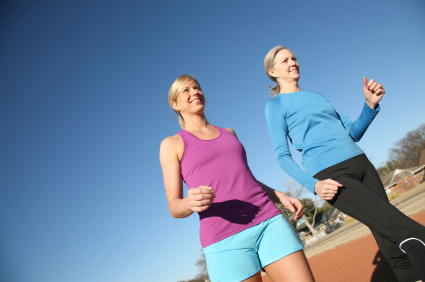 In this post we’ll share tips and warnings to help ensure the time and effort spent outside exercising is beneficial and safe. Just finding free time to exercise is almost as difficult as some workouts. Work and personal obligations are top priorities for many of us; add kids to the equation and you’ll find yourself wishing for more hours in a day. While schedules often dictate our daily routine there are safer times of the day to spend in the sun. When exercising outside, we recommend going as early in the day as possible before the daily temperatures reach their peak. In the mornings the radiation from the sun is lower and the chances of heat related injuries are greatly reduced. Extreme temperatures can turn an outdoor workout into a dangerous event quickly if one has not prepared to be in the heat. The #1 Rule when exercising outside is hydration. Before beginning any physical training, indoors or outdoors, your body needs to be hydrated to perform at the highest level. A body will lose fluids through sweat faster in the heat so it is imperative you are properly hydrated before, during and after being outside. Renee Melton, MS, RD, LD and developer of Sensai recommends drinking >15 ounces of water 1-2 hours before a workout, 8-10 more ounces about 15 minutes right before you start, and continuing with 8 ounces for every 15 minutes of exercise during the workout. Drink lots of water and avoid diuretics like coffee and caffeinated drinks which cause rapid fluid loss. When finished exercising outside you need to re-fuel your body with nourishment in the form of food and vitamins to aid in recovery. Protect your skin from the sun’s UV rays with sunscreen and light colored clothing. Applying SFP 40 or higher will protect vulnerable skin cells from the damaging sun radiation. Wearing light and pastel colors will reflect the UV rays and help to keep you cool in the heat. Avoid dark colors. For endurance athletes training in the sweltering heat we recommend CEP Arm Cooler Sleeves which are designed to shield athletes from the sun. These non-compressive arm sleeves are manufactured with high-density knit structure and UV absorbing yarn which provides over SPF 50 protection. CEP’s Cool-Cell technology reduces the skin temperature by up to 6 degrees, keeping the athlete comfortable and reducing fatigue while training. These cool arm sleeves come in pairs and are perfect for runners, triathletes, cyclists and other outdoor endurance athletes. Even the most vigilant person and in-shape competitor can be overwhelmed when exercising outdoors, so it’s important to understand the risks and symptoms of heat related illnesses. Heat exhaustion and heat stroke are serious medical illnesses common for anyone outdoors during hot summer months. Heat exhaustion is caused by a loss of water and salt; symptoms include: headaches, heavy sweating, dizziness, fainting, muscle cramps, nausea and vomiting. If you or someone you’re feel feels these symptoms, it’s recommended to find a cool, shady place to rest and drink lots of water. Heat stroke is a much more serious condition that may cause death or permanent disability if not treated. When a body is going through heat stroke and unable to cool itself down, warning signs include: warm dry skin, body chills, hallucinations, high body temp, confusion, slurred speech and throbbing headaches. It is imperative 9-1-1 is called ASAP and the sufferer is moved to a cool area until help arrives. Exercise safely at a bargain this summer with MMAR Medical’s SUMMER SPECIAL deals. Enjoy 10% off Breg, DonJoy and Ossur products using coupon code’s BREG10, DONJOY10, OSSUR10. Please note these coupons are valid on regularly priced inventory and cannot be combined with wholesale pricing discounts or other sale priced coupons. First time customers can use our SHIP75 free shipping coupon with them, though!